Travel Notes is a classic travel blog theme, big on images both from the featured post images and the optional Instagram integration. The theme is fully mobile responsive and supports the usual customization features, and also integrates an optional geo-tagging plugin so you can display posts by category on a map. This theme is released under a GPL 2.0 license. How I can download this theme? 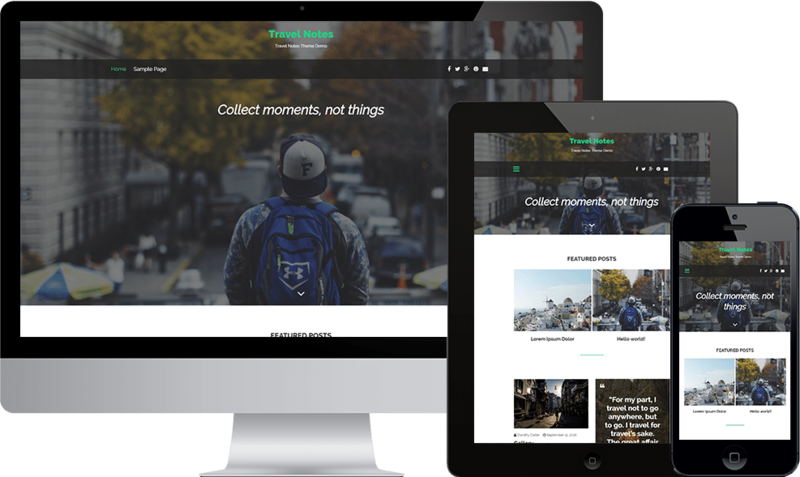 Hi Andres, this theme is still under review by the WordPress theme review team. We’ll add download links as soon as it has been approved and added to the official WordPress theme directory. Hey Charles, do you know how long it takes that the WordPress Team review this Theme? Hi Martin, at the moment it is taking some months for themes to get through the review and approval process. There is a big backlog. You could download the zip here, but keep in mind this version hasn’t been reviewed yet and may be subject to further updates. Is Travel Notes mobile friendly? Yes, of course! I should have mentioned that. We wouldn’t publish a theme these days that wasn’t mobile responsive. You can test the demo site using The Google mobile friendly testing tool here. Hi Dion, make sure you ar eusing the latest version and you can control the media banner via the Customizer. Let me know if that is still not working for you. I am also wondering why the theme recommends a header video height of 0 px?! Hi Sven, sorry for the trouble. We are investigating. Were you using the theme on svenbroeske.de? Hi Sven, we have uploaded a new version which has been approved and is now available if you would like to try it. Hi Henry, were you trying on infiniteweekend.co.nz or another site? I’m not able to replicate the problem on our test site so as much info as you can provide is helpful thanks, e.g. what plugins are you running? I just installed this theme. It is awesome. Thanks for the good job. I wanted to know how I can add the social icons on the navigation bar. Hi Leo, for the social media links just create a new menu and set the display location to “Social Links”. Tthis feature works the same way as it does on the official Twenty Seventeen WordPress theme. You just add custom links to your social profiles on this menu and the theme detects the domain and will display the appropriate icon. Hi, thank you for the awesome template! I was wondering how to remove the “Instagram Feed” from just one of my pages (Gallery). Is it possible to do? If so, would you guys be able to help me out with that? 🙂 Thank you in advance, I appreciate the support. Hey Renato, sorry for the slow response…let me look at that for you. Back soon. We are using 2.0 version in WordPress 4.7.5 and the banner is not working. We tried everything but the picture does not appear in the page. Could you please advice? Hi Ana, I can’t replicate this problem locally so I don’t know what is causing this. Are you still having this problem? If so can you share a link to your site? I’ve got the same problem, with a fresh install of the theme on version 4.5.9 with none of the plugins installed. Hi TJ, can you share a link to your site? Is there any way to do this privately? We’re working on this now and I hope to post an update soon. The theme is perfect except for the fact that I cannot upload header image..
Hi Ahsen, investigating this now and will post an update shortly. make sure to create a page then set the template of that page as ‘Homepage with banner’. Go to Settings -> Reading and set that page as Front Page. Then go to Appearance -> Customize ->Header Media and now you can add video or image. I had the same issue with the header image and I followed your directions,which worked (thanks! ), but now there is a page that say “Front page as banner” on the menu. How do I get rid of that?. Hi Kim, you can go to Appearance > Menus in the admin and control your navigation menu there. By default it is adding all your pages to the nav, but you can control which specific pages/posts/categories appear in the nav. This theme is great, but 2 questions. – how to add the ‘instagram’ at bottom of page like your demo. widget ? Hi Forx, thanks for the feedback. I’m investigating the category images issue. For the Insta feed, just install and configure the Instagram Feed plugin. Regarding the Category Images, you need to install Category Images WordPress plugin, https://wordpress.org/plugins/categories-images/. Then go to Post -> Categories and add the Category Images. hola! theme looks great…. for beginners, is there any tutorial page I can look to in order to maximize theme usage? Hi William, there is no tutorial page at this stage, but to be honest it is really very very simple. To achieve the layout as on the demo you just need to create a new static “home” page and select the ‘Homepage with banner’ template for that. Also make sure you set this page as the home page under Settings > Reading. Finally, upload a header image via the Customizer and this will appear as the hero image there on the home page. All the other options are also controlled via the Customizer and should be pretty self explanatory. thank you for the awesome template, amazing! How can I add instagram post on my site and also I wanted a demo of this theme like how to work with menus and all. Hi SiddhaJK, I havn’t got around to making a demo for this theme yet, but honestly it is very very simple. Check out this previous comment for some guidance. For the Instagram integration please install the Instagram Feed plugin. This would have been prompted when you installed the theme. All the other features like managing menus and sidebar widgets etc work in the normal WordPress way. There are many YouTube videos covering these things including on our channel. I’ ve tried your theme and is very beautiful! One question: it’s possible to insert a footer in home page? Hi Alessandro, anything is possible but this would require some customisation of the theme. There is a footer template file which you can edit in the admin under Appearance > Edit. I do recommend though that you set up your site with a Child theme before making any customizations so that future updates do not overwrite your changes. the theme looks great, but I can’t set a header image for my home, I’ve read that I should create a new static page with the “homepage with banner” template, but the template dropdown menu doesn’t show up while creating a new page, any advice? Hi Edoardo, you are trying to create a new page and not a post right? Assuming so I can’t imagine why the template drop down doesn’t appear. That is a part of core WordPress rather than being something the theme controls. Yes, I was trying to create a page. In the end I somehow solved the problem deleting the theme and reinstalling it directly from the wordpress theme gallery, rather than uploading the downloaded file. Hi Edoardo, thanks for the followup. That is unusual, but glad you were able to solve. All the best. Is it possible to change the font sizes in a blog post? I somehow can’t manage to do so. Yes it is possible, you can download and install TinyMCE Advanced WordPress Plugin(https://wordpress.org/plugins/tinymce-advanced/). This plugin has additional features for the default wysiwyg editor, for example, it has the ability to set font sizes or even font family. Thanks for the theme. Was looking for a “travel-ready” theme to share experiences. Couple Questions. How are the “featured posts” on the main page determined? I can’t find any setting in the create post page, and so far, all my posts appear there, though I still only have a few. How does the “Quote” post type work, in regards to imposing the quote over an image, is that a featured image? Or image in post. Feaatured posts are controlled using the core WordPress ‘sticky posts’ feature. Just mark those posts you want to feature as sticky and they will show up. That’s assuming you havn’t chosen to display categories instead, which is a choice you have in the Customizer. The quote post type uses the featured image for that post and displays the text over the image. Ah, yes, good question…I have been meaning to make a demo video which will explain all the features of the theme and which should also explain that we used a plugin for the light box on the demo site: https://wordpress.org/plugins/responsive-lightbox/ – so that isn’t a feature of the theme itself. You did nothing wrong, I just didn’t provide enough explanation! I’m trying to select the “featured posts” but I don’t know where can I set if a post is “sticky post” or not. Can you explain me step by step? Yes, we added this so that the headline would show up clearly against any background image. I’ll ask the designer to post some custom CSS to address this. already support schema.org or not? Hi Fiqh, no this theme doesn’t support Schema markup at this time. Hi Charles, I’ve been using Travel Notes for a while now and I love it! Just one question: if you change the theme accent color, it will still remain the default green in the tags and category pages, like at the url below. How can I fix this? Hi Edoardo, thanks for the heads up. That does seem to be a bit of a bug. We’ll investigate, fix and issue an update asap. You’ll be notified when the update is available for upgrade in the WP admin in the usual way. Sorry for the inconvenience. Great blog too. Love the photos. Hi, thanks for the theme! Is there a way to change the speed of the “featured categories” slider on the home and posts pages and/or to add arrows to show that there are additional categories? thanks!! Hi Liz, that is not a setting that you can control I’m afraid. It is a good idea though and I’ve added to the list of feature updates which we’ll implement in the next version. I can’t say when this will be though. We have to fit in these updates to free themes around the regular work schedule so it might be a little while. When I add a video article, how do I make the video visible in the list of article? Hi Rémy, did you set the post type to “Video”? Hello! I love this theme! I’m a bit stuck, for some reason the menu content is infiltrating my header image and I can’t figure out how to fix this. Hi Katie, glad you like the theme 🙂 I’m not sure what you mean by “the menu content is infiltrating my header image”…can you elaborate? The content of my other menu pages are being displayed on my header image, so instead of it just being the picture with writing from my home page it also has writing from other pages and I’m not sure why it is doing this. Hi Katie, do you mean the main navigation bar displaying below the title and above your content? That is as designed. You can see the same thing on the demo site linked above. Sorry if I’m misunderstanding. Oh, you mean the text that appears below the nav bar over the top of the image of Big Ben? That is the page content for your home page. You can remove that by editing the home page. No, thats not my home page, its actually the content for other links on the nav bar and I’m not sure why they are infiltrating my header image. Its probably a simple fix that I’m missing but I can’t figure it out. Hi Iain, sorry for the slow reply. I’m travelling myself at the moment so internet access is not consistent. Have you customized the home page template in anyway? If not have your installed any other slider plugins? I ask because those would be the two most likely reasons for a problem with the featured post carousel not working as expected. With an instagram video is it possible to change video size? hmm, let me come back to you on that one. Hi Hein, we havn’t done this because I think our themes are simple enough that you don’t really need any demo data to see how they work. If you watch the video above you will have a good idea of how it all works. Hi, I’ve been using this theme for a few months and I love it, but I can’t figure out how to make an specific single post full-width with no sidebars. I’ve found a lot of confusing videos on how to do it. Is there any quick and simple way to do that! While working on localhost, Suddenly my header image on blog has stopping showing up. I tried uploading new image as well but still same problem. Could you please tell if any way to fix this problem? Hi Manoj, very difficult to say what might have caused this without being able to view your site. Did you make any alterations to the template files or CSS? Could also be a plugin issue which you can test by disabling all plugins and seeing that “fixes” the problem. If so then reactivate all plugins one by one to see which one is the cause. I’m in the process of setting up my blog, still playing around with content and I have to say, I love this theme, it’s great! I’ve added the categories sticky notes on my front page, but I was wondering is it possible to change the heading from “Featured Categories” to “Destinations”? Sorry if this has been asked (and resolved) previously. Hi Alison, that’s not presently a setting. You’d need to dive into the code to change this. But it is a great idea. We’ll make it possible to edit the sub title in the Customizer and release an update asap. * Big use of the WP Geo plugin, which appears to be abandoned. The web site referenced for documentation is gone. Otherwise, so far I’m finding it quite nice. Hi Magnus, glad you like the theme. Yeah, we’re not sure what to do about the GEO plugin. It still works right now but we are looking at other options and will issue an update if we can find a suitable replacement. That’s the trouble with building on an open source ecosystem. Sometimes some of the things you rely on go away. I’m not sure what is the issue with your header image, and I’m not sure exactly what you mean. I can see you are using a mobile plugin so the mobile version of your site is not actually the Travel Notes theme, it is powered by the plugin. Also, to be clear the hero image you see on the home page of the demo site only appears on the home page. This is set in the Customizer under Header Media (in fairness not a great label in hindsight). Media banner is not working. I am using version 2.0.2 and when I put a image, it does not appears on the top of the page as expected. Could you please help me? Then go to the Customizer > Header Media and upload your header image. It will then appear full screen on your home page just like the demo. I hate the instagram footer with all my pics. It shows in all my pages and cant seem to delete it. I need help. I like the theme but not seeing the same 9 pics in evey page! Hi Wilson, the Instagram display on this theme is powered by the Instagram Feed plugin you installed and activated when you first installed the theme. To turn it off simply disable the plugin under the Plugins menu in the admin. Hi Charles, is there a possibility to make the navigation/menu bar sticking at the top of the window while scrolling? I will have to mess around with the settings, because it pushes the navigation tabs to the left, more like in columns than in one line. But for now, it will work. Looking forward to the update, which has this feature build in. Good work! This appears on the default Home and Blog pages. The error has been resolved. The theme cannot handle a Post in which the “Format” option is anything other than “Standard”. In other words no Video. Thanks Matt, investigating this error now. My featured image is not being displayed at the top of the post. I’m not using the WP Geo plugin as suggested, not sure if this has anything to do with it. Any help would be great. Apparently the template works perfectly beside a small matter with the Youtube link. I’m facing a problem while playing the youtube video on my mobile device ONLY therefore on my laptop everything looks fine. Could you please let me know if you got any idea? Hi Karim, can you provide a link to your site in development? I can’t replicate the issue so would be useful to see it first hand. Look forward to receive your answers. Hi Karim, turns out that there isn’t a solution for this, it is core WordPress functionality (I didn’t realize this myself until now). See here. So WordPress automatically hides video headers on mobile. For this reason you should be sure to upload an image header as well. I have tried to contact the developer of the plug in but they appear to be uncontactable. Therefore I am contacting you. Hi Fred, just to confirm, you are using this plugin yes? https://wordpress.org/plugins/wp-geo/ (WP Geo, rather than WP Geocode). While the plugin hasn’t been updated for a while it is still working for me on the demo site, so I’m not sure what the problem maybe on your site. Can you share a link to your site in development so we can check it out? Yes was definitely WP-Geo I have now deleted it. It is possibly the version of WordPress – I am on – the latest? Hi Fred, the demo site is running the latest version of WordPress and WP Geo is working fine with it so I don’t think that is the issue. If another maps plugin works then that’s great. In addition to the Geo plugin I have a couple of other requests. 1 How do I change the header ‘Featured Posts’ to something more relevant to my requirements (or remove it completely)? 2 How can I remove the Author information under each post in that section? Hi Fred, both of these things can be achieved in the Customizer. Login and goto Appearance > Customize. In the Customizer go to Home Page Features. There you can choose to display featured categories or posts in that section right under the header, and you can also customize the sub-heading to anything you like. If you chose to feature posts you can use the core WordPress sticky posts feature to control which posts are featured there. In the Customizer you can also go to Post Settings and choose whether or not to display the Author bio and/or related posts at the bottom of each post page. I have seen the area to remove Author etc. This works with the details in the post. Where I have a problem, however, is on the home page. if you scroll to the bottom of the page there appears to be a section where the posts appear a second time. It gives the title, room for a description (I think) and the author and date of the post. It is this section I need to remove. I cant upload a screenshot but if you go to twittwoo.co.uk and scroll down you will see what I mean. Hi Fred, this is part of the design. The idea is you can feature particular posts right under the hero image or video, while all your latest posts appear below the featured posts. If you want to remove this you will need to customize the home page template, and if you do that I also recommend setting up the theme as a child theme first so that any future updates do not overwrite your customizations. Thanks for the amazing theme, really liked the cleanliness and responsiveness of it! I’m struggling with two issues though. 1 – I’m trying to insert a section below or above the featured posts on the front page, without being inside the banner, and am not being successful. I saw the demo though, and noticed that it is possible, could you help me by doing it, please? 2 – I have two menus on the header, one for the pages and one for the social icons. Both are showing a “navigate” sign (with scroll menu) whenever I open the page on mobile or tablet. I would like it to be exactly like the demo version, but it’s different. As in the demo, you can choose to display Featured Posts or Categories below the main banner on the home page (and above the latest posts grid). To do this goto Appearance > Customize and choose the “Home page features” option. The settings should be fairly self explanatory. I’m not sure what you mean about the menus. On mobile devices the main nav menu will collapse under a “hamburger” style menu icon. This is pretty standard bahaviour on mobile because the menu would otherwise stretch over many rows on the mobile device and wouldn’t look very good. Is that what you mean? Perhaps you could share some screenshots of what your site looks like or share a link so we can take a look. Is there a way to format the text that automatically populates under a post once it’s published on the home page? Hi Abi, there is no admin setting for this. To change the styles of the post excerpts displayed on the homepage you’d need to adjust the CSS. To be clear though this wouldn’t allow you to add formatting like bold or italics to individual words. How can I install the demo on WP? Hi Alessio, you can install the theme directly from the WP admin in the usual way. We don’t have any demo content to replicate the demo site, but honestly you could easily do this using on the many dummy content generators and the stock standard theme. to build a site just like the demo doesn’t require anything special. Why does the Travel Notes theme condense my PayPal drop down box so that only half of it is visible? Is there a way to make it appear properly? I shows up just fine on my other sites. Hi Heather, I’m not sure what you mean by this. Are you still using Travel Notes or have you switched already? What’s the recommended size for the banner? Thanks. Hi MJ, the banner is 100% wide and keep in mind that different visitors will have a different sized monitor. Some quite large. I’d suggest a min. of 1500px wide, but maybe 2000px if you want to be sure to cater for larger monitors. Of course you’ll need to optimize such images to minimize file site. Thank you for this design! I’m interested in using the theme, but I’m struggling to get anything to appear. I can’t get an image to display in the header (I’ve tried a 1920×1080 image, as well as smaller and larger sizes). I also can’t get any posts to display on the homepage (I’ve selected the Categories option in the Homepage Features section). Hi Sterling, happy to try and help. For clarification have you already created a static “home” page, applied the bundled home page template to this and set it as the home page in the Customizer? If you’re not sure what I mean by this you can watch the video above to see an explanation at about the 4:20 mark.